Obituary – Lancaster, Billy Charles « Perry High School Alumni Association, Inc.
Bill Lancaster, 48, 410 Ivanhoe street, was pronounced dead upon arrival at Perry Memorial hospital at 6:10 p.m. Saturday, the victim of an apparent heart attack. Funeral will be at 2 p.m. Tuesday at Parker-Brown Funeral chapel with Rev. Ester Bass, pastor of the Assembly of God church, officiating. Burial will be at Grace Hill cemetery. Lancaster was born Jan. 9, 1936, at Southard, Okla. He was the son of Ted and Beatrice Lan­caster. He moved with his fam­ily to the local area in 1938 and was a graduate of Perry high school. He served with the United States Army and was affiliated with the Baptist church. 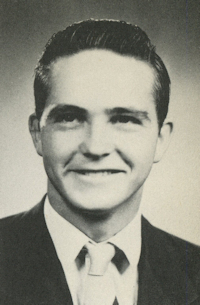 He and Erma Barnes were married April 13, 1963, at Wellington, Kan. Lancaster was em­ployed as a driller for the Gene Porter Drilling company. In addition to Mrs. Lancaster, of the home, survivors include one daughter, Kelly Bode, Perry; four sons, Alan Estes, Duane Estes and Larry Barnes, all of Perry; and Tony Estes, Alto, Texas; his father, Ted Lancaster, Sr., Perry; two sisters, June Williams, Stillwater; and Yvonne Cope, Enid; one brother, Ted Lancaster Jr., Perry; a granddaughter, Amber Bode, and a grandson, Alex Estes. Lancaster was preceded in death by his mother and one brother.